become a regular feature, and a main point of contact for members. in robots, please let them know about BARG. if you would like to enter, and which category or categories interest you most. local group, and enter a joint project. copies are available from Innovonics, 147 Upland Road, East Dulwich, London SE22. One of the most misunderstood items connected with robotics is the electric motor. and in the moulded plate carrying the brushes. stronger magnetic field, making the motor more powerful. working is usually almost irreparable. high and continued use will cause the brushes to burn away - irreparable damage. motors in general require higher voltages. a couple of deaths, so don't do it. without fancy equipment is difficult to measure. somewhere about right, giving a most efficient speed of about 6,000 rpm. useful to the rest of us. should use a reduction drive of 1,600 to 1 (4 x 4 x 100 = 1600). there are enough problems in building robots without inventing some of your own. are adjustable, so you can set just the ratio you want. number of broken bits of plastic. running on the correct voltage, there will still be some sparks, although small. Second, connect a 0.1 uF capacitor directly across the motor terminals. those with Radiospares accounts, they also do them and cheaper. 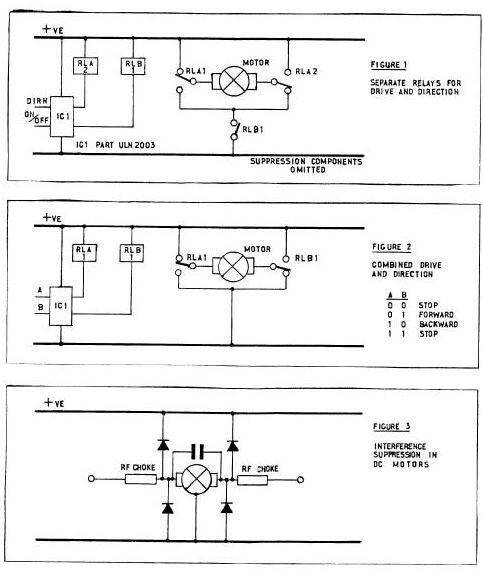 end result will be a circuit like that in figure 1 below. least one diode across the terminals, to protect the transistor from damage. variable "port". Hebot requires eight bits for its microswitch impact detectors. the mobile takes place and a summary of turns to date is displayed. based on their running totals. Ace/Hebot control illustrates three elementary but easily overlooked points. uction must be sent to the port, even after the timing loop has completed. bump fruitlessly into the same obstacle field indefinitely. area without tangling its cable to the computer. : bleep cls . "HEBOT TO ACE !" cr cr . "PROGRESS REPORT REQUESTED.. ,"
cr cr cr cr . "NO OF RIGHT TURNS : "
rts @ . cr cr . "NO OF LEFT TURNS : "
ltns @ . cr cr . "TOTAL NO OF TURNS : "
ttrts @ . 15 dur cr cr cr . "OK HEBOT ?" cr cr . "RIGHT TURN NO " turn @ . cr cr "TOTAL RIGHT TURNS : "
cr cr . "TOTAL LEFT TURNS : "
: intro cls invis . "HEBOT CONTROL"
cr cr cr ." In this routine HEBOT will take"
cr cr ,"   simple evasive action on"
cr cr ,"   collision with an object"
cr cr cr ." IN EMERGENCY; PRESS SHIFTED"
cr cr ." 'BREAK' AND ENTER 'S'"
cr cr cr ." OK, Master,"
cr cr ." Press SPACE to start me..."
chip), we need one ON/OFF and one double-pole changeover relay for each motor. when the transistor is off. 1 Amp relays would then be perfectly suitable.